“I miss camp,” I lamented to my wife as we sat outside eating dinner. Barely two hours after returning to my comfortable, air-conditioned house in suburban New Jersey, this middle-aged professional—more comfortable in a conference room than a Gaga pit—longed to be back working 12-hour days for two weeks in the sweltering humidity and periodic mosquito attacks of a children’s sleep-away summer camp in the woods of Palmer, Massachusetts. My journey began in December 2012 at the Camp Ramah New England (CRNE) Winter Reunion in Rockville, Maryland. Outside the cacophony of jubilant, airborne, screeching boys and girls, I met with Josh Edelglass, the wonderful assistant director at CRNE. A parent of my daughter’s camp friend suggested I speak to Josh to offer my services this kayitz (summer). “What can you do?” Josh asked. I didn’t think writing briefs or cross-examination was the answer he was looking for. “Sports!” I declared, having coached kids for several years in soccer, basketball, baseball and other activities. But I could only offer two weeks as my vacation time from work. I soon learned that the rosh sport (sports director), a gifted triathlete and teacher from Canada, could not come until the second week of camp. I was told that my services could be helpful during these first two weeks, coaching campers as well as guiding the talented mishlachat (Israeli delegation) as they coached American kids. We had a shidduch (match)! What struck me most when I arrived at Machaneh (Camp) Ramah during the first few days of shavua hachana (staff week), before campers arrived in June, was the boundless energy, ruach (spirit), intellect (both religious and secular) and organization of the staff and camp operation. The passion was infectious. It was demonstrated in song and dance, and in conversation about making all campers—regardless of physical, emotional and cognitive development stages—comfortable and enriched. I saw how serious the staff took the educational sessions, ranging from allergy sensitivity to emergency preparations to making d’var Torah presentations. As a parent of two hanikhim (campers), I was heartened by it all. Then came the “drash-off.” On that first Shabbat tzevet (staff Shabbat), the rosh eidot (heads of the divisions) paired up and engaged in a spirited challenge against each other to present the various prayers of the Amidah in an entertaining and energetic way. I was blown away—not just by the creativity and knowledge that these young staffers demonstrated, but by the unbelievable support amongst the nearly 300 other staff that followed each drash, with songs that developed into cheers, and cheers that developed into dance. That entire first Shabbat was a celebration—of Jewish learning and life, of Shabbat, of youth, of community. A fellow parent and I marveled at the staffers during the drash-off, and we agreed that these are the types of young adults we hope our children aspire to be. Once camp began, I was fully enmeshed in the experience. From daily exchanges of “Kapara alecha, achee!” (“I care about you, dude!”) with my young Israeli sports staff colleagues, recently discharged from heroic stints in the Israel Defense Forces, to learning the proper order of hand-table slapping during birkat hamazon (blessings after meals), each day brought new life to camp, and to me. I couldn’t help but walk around with a smile. On the sports fields, I was equally elated. Having the opportunity to coach kids consistently for two weeks, to draw up and review lesson plans each morning according to the sport, age and skill level, and later teach it and develop it in games, brought me great joy. To help children garner new skills in a short period of time and witness their growing confidence was a blessing that coaches, teachers and, of course, parents, uniquely understand. I was as pleased seeing my fellow mumchim (specialty staff) and madrichim (counselors) place their supportive arms around campers’ shoulders and the corresponding smiles on campers’ faces as I was by the passing excited calls of “Hey, Coach!” from kids now familiar to me. From the agam (waterfront) to the omanut (arts and crafts), I saw the same level of dedication from staff throughout and their satisfaction in helping campers enjoy their activities and summer. At the end of each long, hot day, when I picked up my 8-year-old son, Joel, from another great day, we enjoyed surprisingly good communal meals with other children and fellow staff among the campers at the chader ohel (dining room). We then either attended other evening activities (campfires!) or simply walked around or played ball. We each then showered and got ready for bed. By 9:30 p.m., Joel and I were wiped out. We eased into our perpendicular twin beds in our cozy 8×8 room in bunk 34, with the shared community bathrooms. Despite the heat wave the last week making sleep sometimes difficult, even with fans roaring, I noticed how comfortable this all felt, how suddenly I felt a part of this Klal Yisrael—no longer just an observer, but a participant. Someone mentioned that at camp, the days feel like weeks and the weeks feel like days. When two weeks ended, it had indeed flown. And yet, like anyone familiar with the concept of “camp time,” it felt like in two short weeks, I had become accustomed to a special new life and community. And now I wanted to live it—everywhere. I started thinking about returning to that conference room in New York City for the first biweekly staff meeting in my office upon my return. And when asked, “How was your vacation?” I imagined replying in Hebrew. When we arrived back to our New Jersey neighborhood, my very supportive wife (who indulged me by allowing me to work these two weeks during our “family vacation” and by making Shabbat visits to be with all of us), Joel and I decided to walk to a nearby pizza tavern for dinner. We wanted to walk and eat outside on their picnic tables, trying to continue as best as possible the camp dining experience (walking to the dining hall and eating at communal tables in hot but not uncomfortable conditions). When we returned to our house, the thunderstorms that we left behind in Palmer had now followed us to New Jersey, reflecting our flat mood. And then our power went out. Suddenly, we had none of the comforts we thought we would have longed for, like air conditioning or television. And Joel complained of the difficulty sleeping in his room, alone and overheated. I suggested we go to our cooler finished basement to sleep. With the lights off, like Shabbat at Ramah, we positioned spare twin mattresses on the floor like we had done in bunk 34. As I kissed Joel goodnight, I smiled. We were back at Machaneh Ramah again. 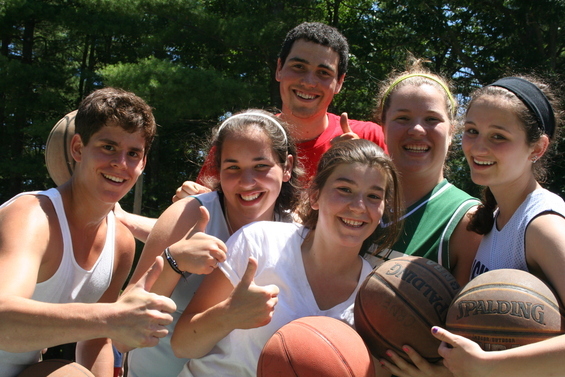 Louis Piels is a Ramah parent who joined the camp sports staff for two weeks this summer.